Special Offers North Central Family Dentistry. 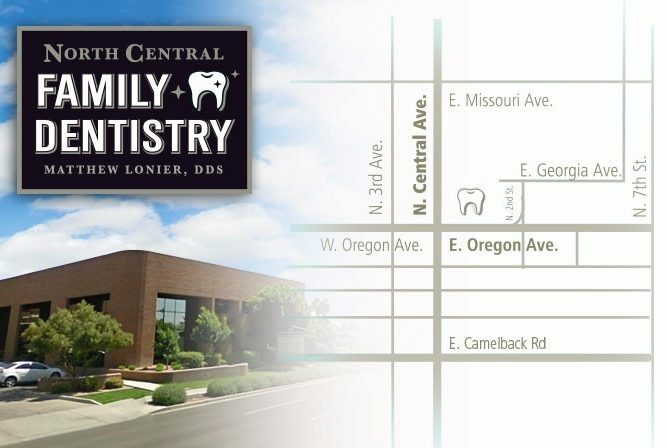 We are a North Central Phoenix dental office providing modern dentistry in a welcoming, relaxed environment. Dr. Matthew Lonier and his experienced staff can help you with all your general dentistry needs. From a routine cleaning to porcelain crowns, bridges, fillings, teeth whitening, and implants, we look forward to serving the dental needs for years to come. Your first visit is no cost to you with most insurance. Don’t worry if you don’t have dental benefits. For $149 we offer a comprehensive exam and oral cancer screening with the dentist, any necessary digital x-rays, and your first cleaning with the hygienist.